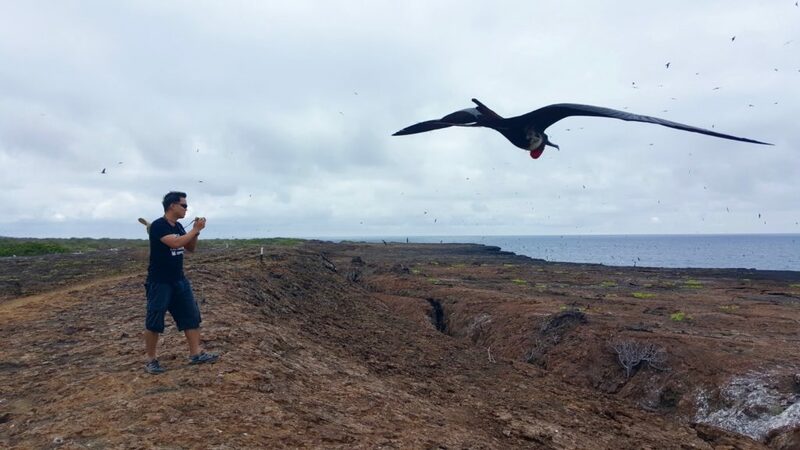 7 Life Lessons That the Birds of Galapagos Have Taught Me - Holy Smithereens! 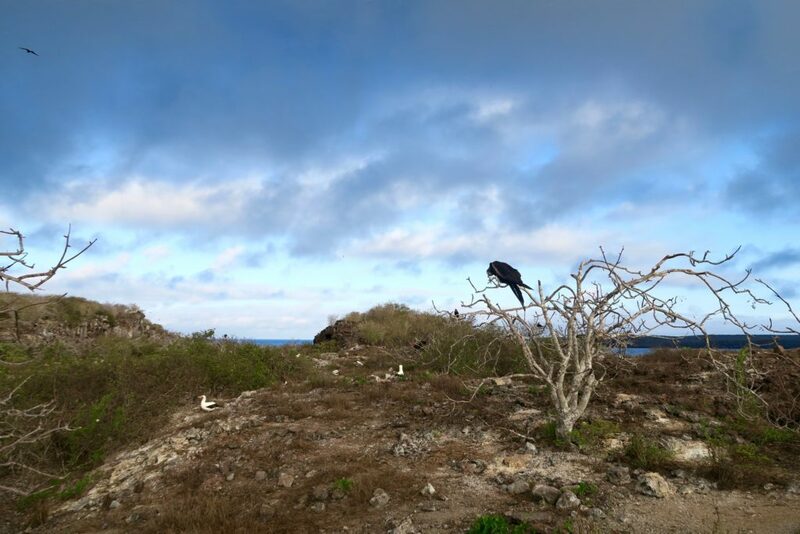 Bird watching in the Galapagos is quite a hypnotic and transcendent experience. I’d be the last person to suggest bird-watching but I found myself so very mesmerised observing birds in the Galapagos. I will confess. Much as you see me with wildlife a lot, there are two three animal species that I just can’t. In order of most tolerable to downright over-my-dead-body: Birds, monkeys and cockroaches. 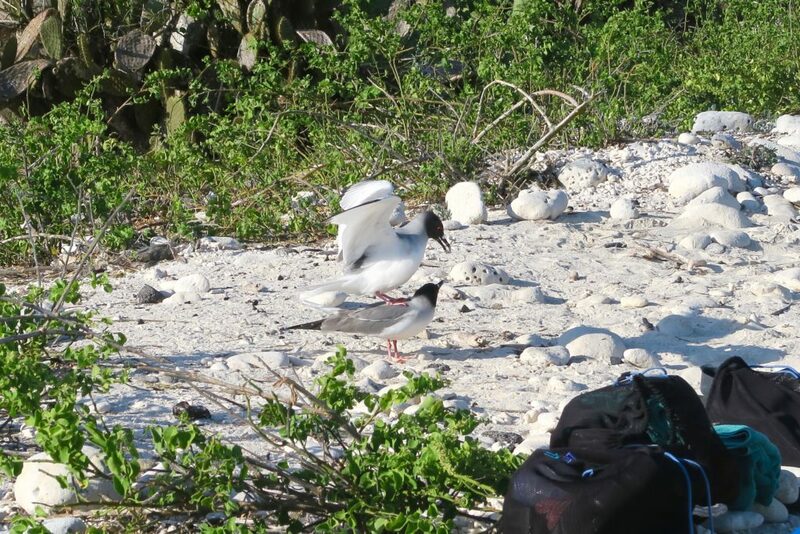 So when I heard that our first itinerary stop with MV Origin is Genovesa, an island inhabited by birds, I thought it’s a great way for me to get up close and personal to a species that I am not too familiar with. I read beforehand that the birds (and all wildlife ) of Galapagos behave so differently from all others that I may have seen before. 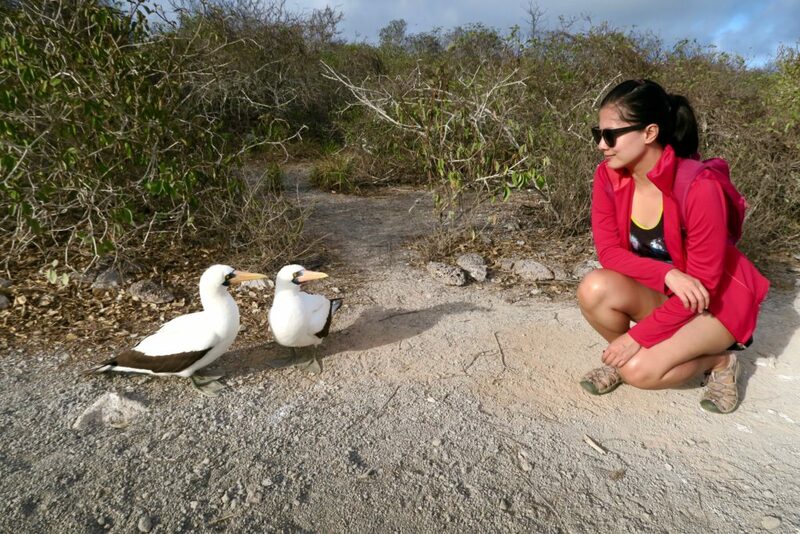 But what I totally didn’t expect was how I would reflect upon life’s lessons while observing the birds of the Galapagos. Named after Christopher Colombus’ birthplace of Genoa, Genovesa Island is a horse shoe-shaped island that occupies about 14 square kilometres. 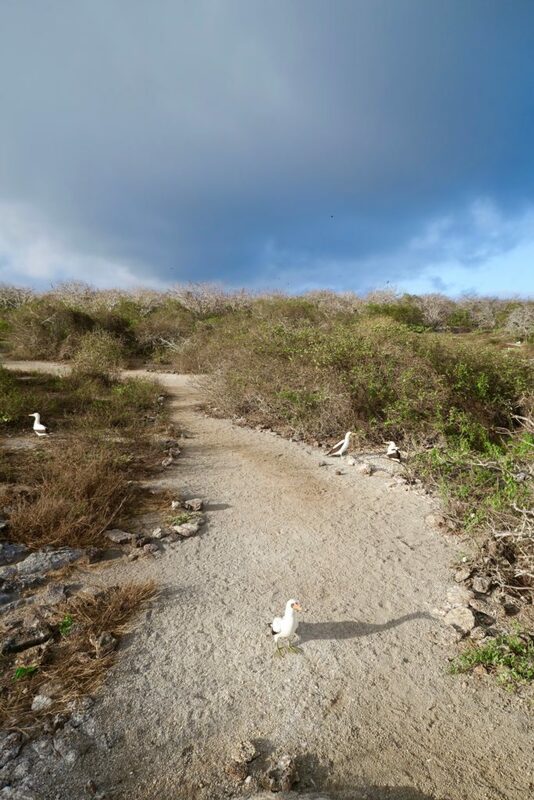 And because of the large and varied colonies of birds which inhabit the island, it is also known as the Bird Island of Galapagos. We started our day early. The sun was still contemplating whether to make a full show or not. As we neared the island, our zodiac hummed to a slow speed. 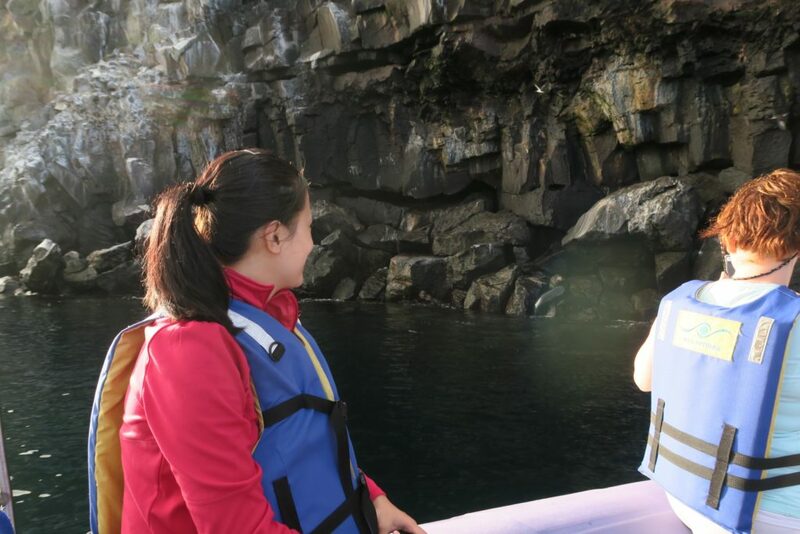 We were gliding noiselessly and our naturalist guide Gustavo asked us to keep our eyes peeled on the rocks. 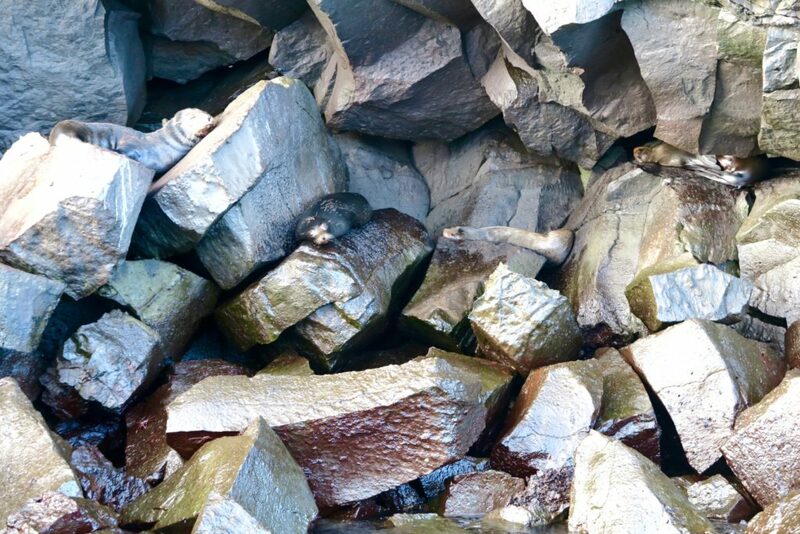 On first glance, they seem to be just normal dark boulders. As we scaled Prince Philip’s steps, I can hear squawks, chirps, tweets and screeches from various kinds of birds. It sounded like there was a party up there! When we finished the steep climb (there are hand rails so it’s very manageable), the first bird I saw had its back turned to us (above photo). It gave us a look, cawed briefly, then went back to whatever it was doing. Shortly after, a little Nazca Booby waddled its way towards us as if to just curiously check us out. Then it went back to its comrades. The curious behaviour of these birds was what really astounded me. As we made our way along the path, none of them scurried or flew away even as we got quite close. It was at this point that I realised we really needed a guide because we were quite overwhelemed with the sheer amount of birds that we don’t quite know where to look! 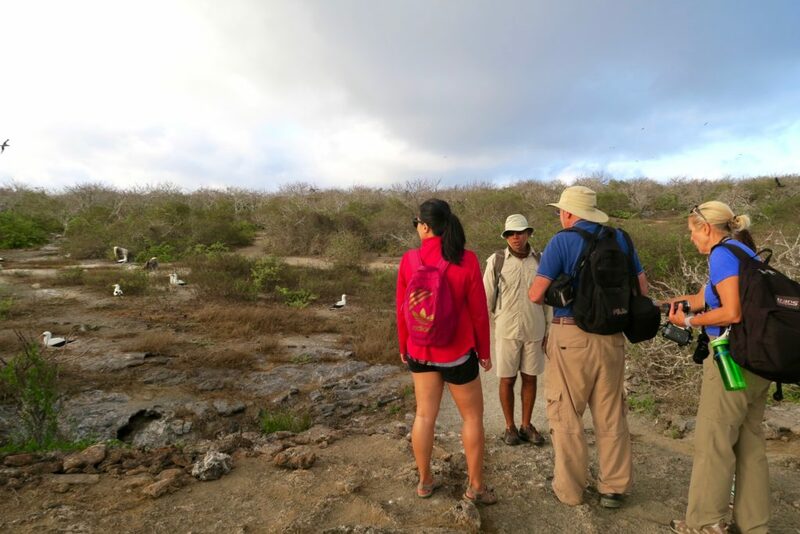 The first 20 minutes in Genovesa seemed like a live crash course of ‘Birds of Galapagos 101’ as Gustavo identified and introduced to us the various birds of Galapagos, most of which can be found in this one island. “What are you looking at?” If Nazca Boobies could talk. 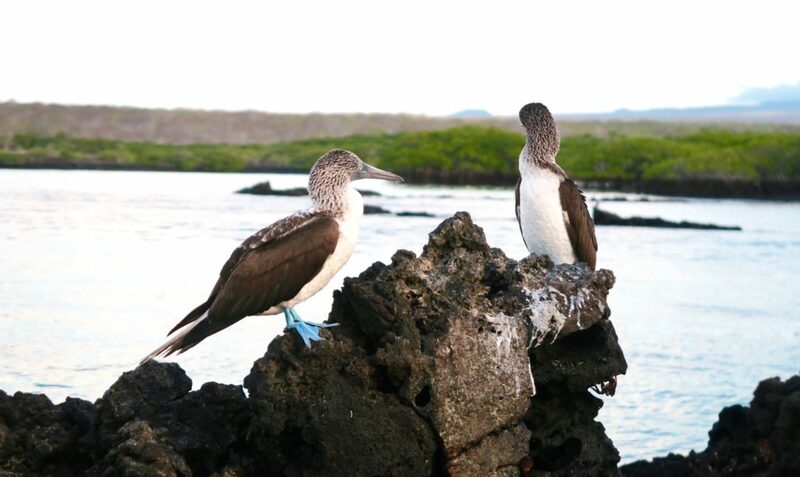 Bird enthsiasts will definitely want to visit Genovesa Island as it is the best place in the Galapagos to see red and blue-footed boobies, Nazca boobies, Swallow-tailed gulls, Galapagos Frigatebirds, Darwin’s Finches and even the elusive Galapagos owl. There were moments during our exploration of the island that felt very Twilight Zone-ish. When we reached the tip of the island, it seemed as if bees or wasps were buzzing all about, but as you walk closer you realise that it’s all BIRDS. Even if I’m not a bird person myself, I could have stayed there for hours, mesmerised with all the swirling and live action going on. Behind you, there are birds calling and dancing for mate hunting, next to them is a mother feeding her chick, and then you’ve got Frigatebirds chasing other birds, other types of birds diving into the water for fish…the action was just endless. But where were we? Ah yes. Life lessons. Because I am not too familiar with birds’ behaviour and body language, I found it quite fascinating to learn about the different Galapagos birds first hand, and in the most interactive classroom at that. 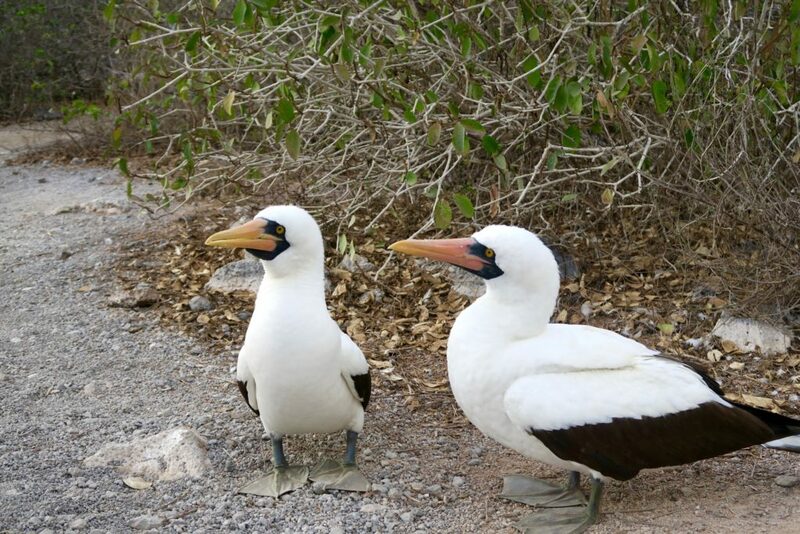 But sibling rivalry for the Nazca Boobies in the Galapagos is totally on an Abel and Cain level. In fact, there’s a name for it: Siblicide. Our guide Gustavo told us that every single Nazca Booby we see are all murderers. All of these “cute” baby birds have either killed or pushed off their sibling even when it was still a frail little chick. Nazca Boobies will hatch two eggs. This is to ensure that there will always be one that lives. The eggs are hatched 10-13 days apart. The age gap will have the elder chick already much stronger than the second chick. If the first born is strong enough and has no abnormalities, it will be in his nature to get rid of his newborn sibling. And the mother will also not do anything. After all, she had to do that too! It sounds bizarre and hard to believe, but watch this video. 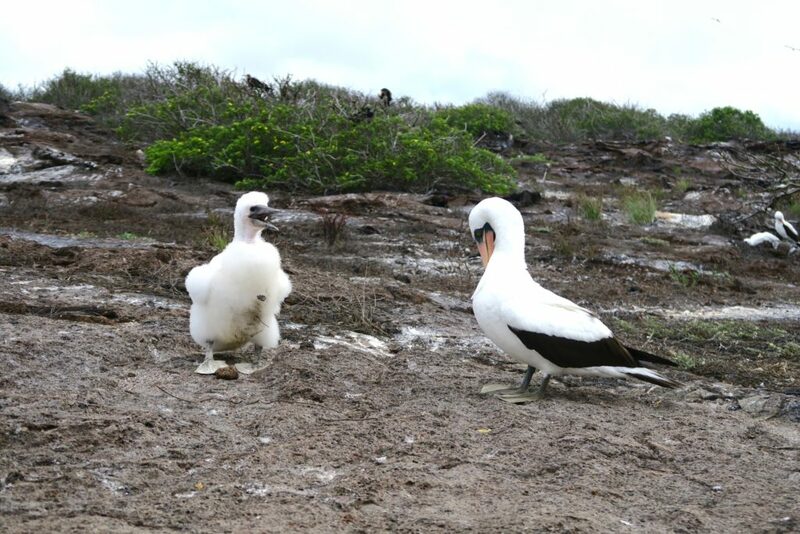 I myself have not seen it (a siblicide) in the Galapagos. I’ve only seen a lot of mother birds with their lone chicks. And the fact that the chick is by itself could very well mean that it had just gotten rid of its sibling. Life is unfair. We all have to learn that the hard way. 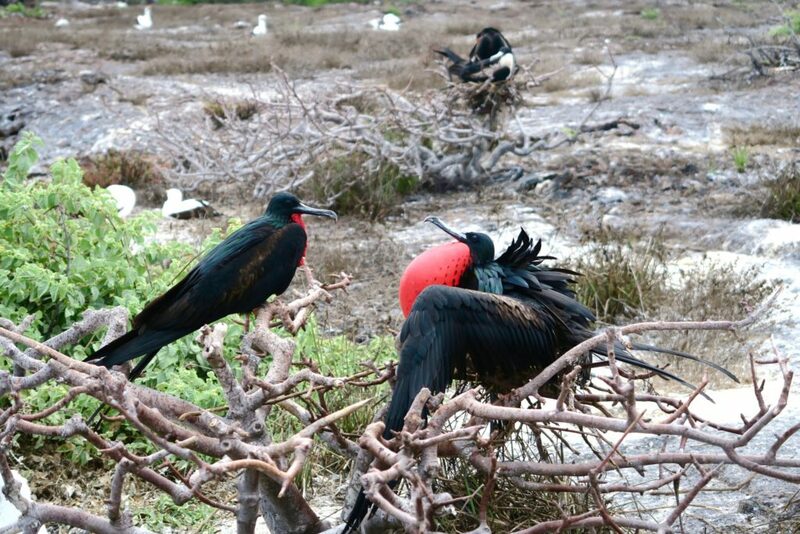 And no one knows this better than the Galapagos Frigatebirds. See, they are sea birds. Yet they are the only seabirds that cannot swim or float on water. That’s because their feathers are not waterproof so they will sink once they start wading in the water. Yet they are seabirds. Meaning they feed on seafood mostly. So how does that work? 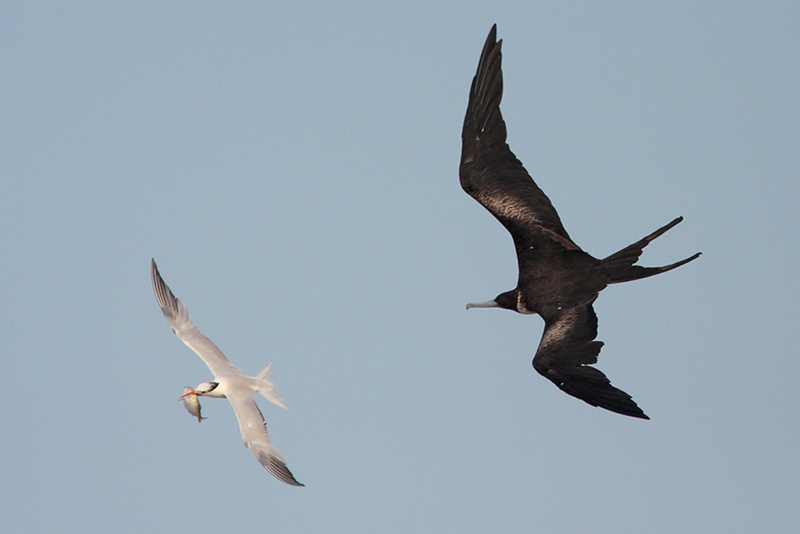 A frigatebird chasing a smaller bird. They usually chase after the smaller Nazca Boobies, who have hunted food by themselves. When a Frigatebird sees another bird with a catch in its mouth, it will start to chase them and will harass them until the other bird will drop or regurgitate its food, which the Frigatebird will swoop to pick up. Sometimes the smaller birds will descend swiftly to the ocean level, because they know that the Frigatebird will not be able to fly so close to the water. 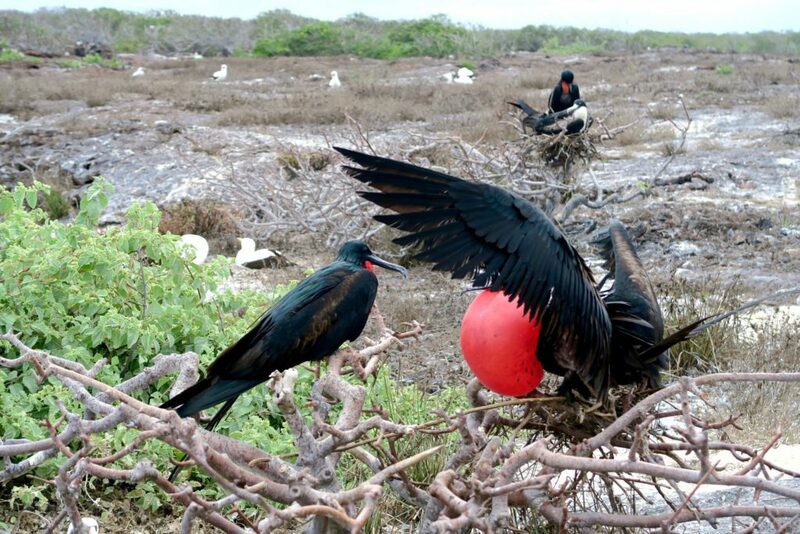 In other words, the Frigatebird is the Aladdin of the Galapagos (‘I steal only what I can afford’). It’s a thief basically. But what choice does it have? Nature didn’t endow them with the ability to swim. What they do have though, are long hooked beaks to not only make snatching easier, but it also allows them to catch the occassional flying fish without getting too close to the water. 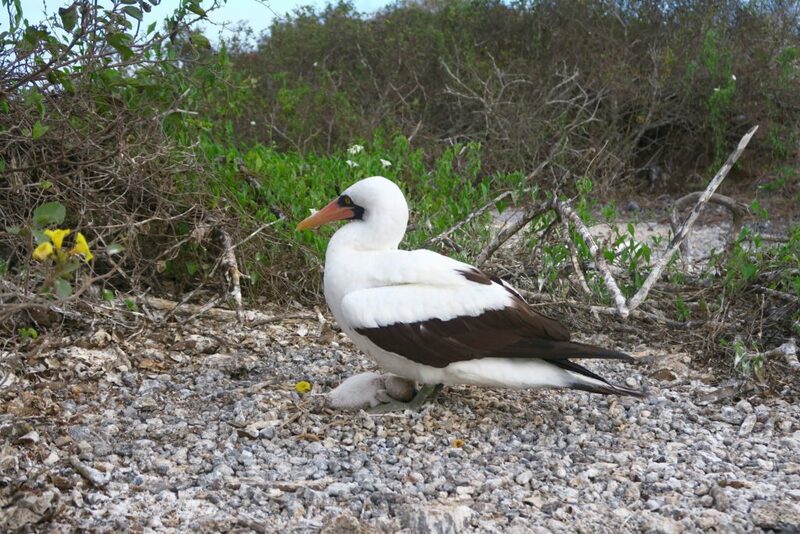 And they are also one of the bigger birds in the Galapagos so they have more speed. And that’s how nature makes itself fair, in a roundabout, still-unfair way. We arrived in the Galapagos smack in the middle of mating season. No other bird makes such a show of mating call than the Frigatebird (yes, the same theiving species). The male Frigatebirds have a red “collar” attachment round their necks, similar to a Turkey’s under-the-chin saggy flaps. But the Frigatebirds’ flaps can be inflated tremendously (above). The males do this, puffing out their red ballons (with some looking like they’re about to reach bursting point) while spreading their wings out and doing a shimmy-like manoeuvre. This is to both attract females and also to ward off other males that perch in the same area in the same hopes of picking up a mate. Soon after the above photo was taken, the other male Frigatebird fled after the bird to the right huffed, puffed, and gave some intimidating moves. The Nazca boobies have an endearing way of mating. The males show off to their potential mates the assets that he has amassed: rocks, twigs, leaves, etc. He will pick up each one by one and offer it to the female. If the female is interested, she will pick up the said offering. Male competition, best foot forward, showering females with gifts — this all sounds too much like the human world! Once they find a mate though, most of these birds can be quite faithful. I observerd that most Nazca boobies, blue and red footed boobies that I saw were in pairs, and they have an air of contentment and security in them. Life is indeed better when you are with the right companion. They hunt together, make their nests together, and just go about daily life with each other by their side. 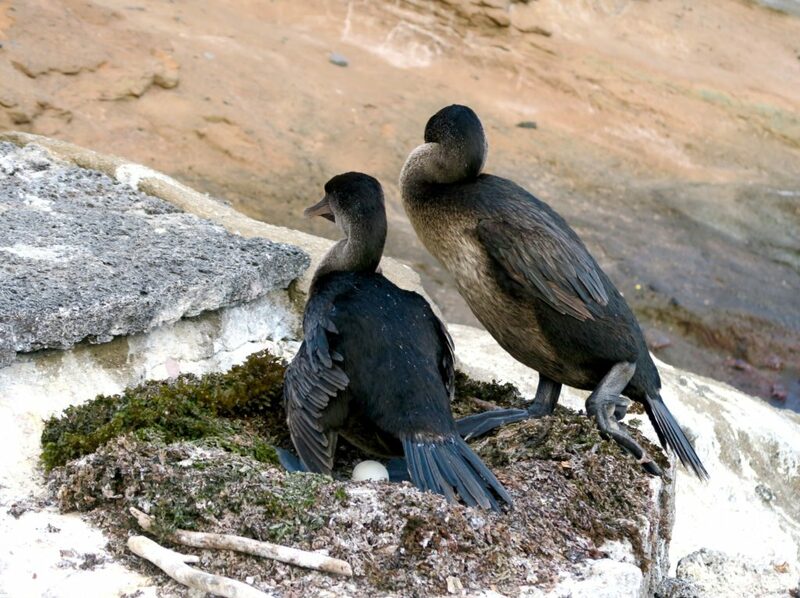 From meticulously building their unborn chicks’ nests to caring for the vulnerable chick – the birds of Galapagos seem to have a dedicated parents code in their mindset. We also saw a female Frigatebird feed its chick that was crying endlessly. You will see this in the video above. The chick seems full-grown sized, yet all it does is screech and screech waiting for its mother to return with food. In the video, after the chick was fed, it cried to have some more, and the mother opened her mouth and out came a squid. The chick had this squid in its mouth but dropped it. And what does it do? It cried and cried some more until the mother left to get steal more food. Man, these chicks are quite spoiled! But its amazing to see how these same birds would show apathy towards siblicide, and give so much care and rearing to its lone child. Whatever the case, this I have to say: The birds of Galapagos sure prove to be much better, dedicated parents than what we can say about some of our kind! 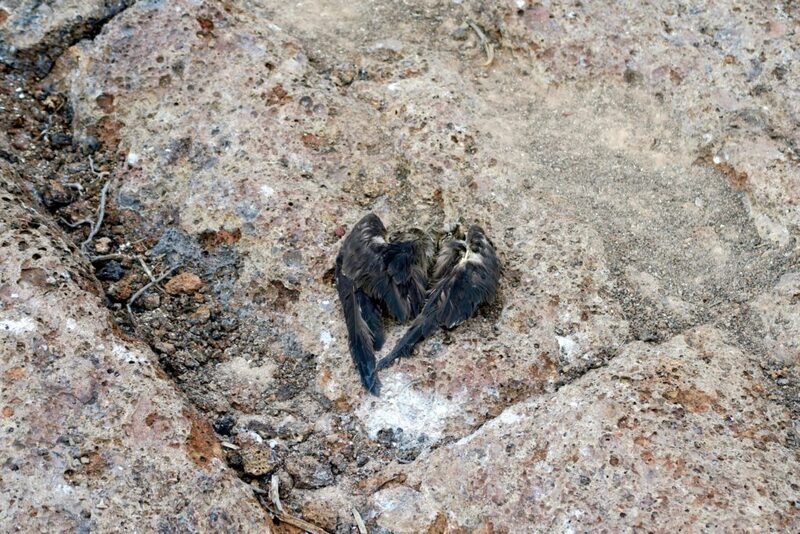 It’s not uncommon to see remains of birds in Genovesa. While it’s not a bird-eat-bird environment, it’s sheer evidence that survival of the fittest is the game in this world (and our world too). The biggest trial I’ve ever faced is losing a loved one and the depressing bereavement that follows. I’ve just started to slowly learn to move on normally (after ten years), and therefore this is my biggest fear. To again lose a loved one and go through the madness once more. 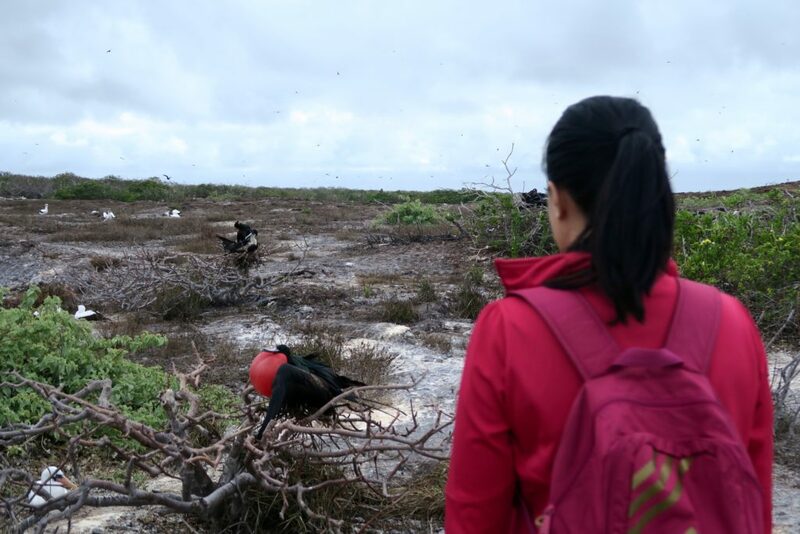 Walking along Genovesa island and seeing carcasses dangling in trees, or in the last stages of decay, while other species of their kind go about their daily lives filled me with a strange sense of comfort. Moving on is natural. It is the only way forward. 7.) And sometimes, you just need to go out there…. …and do what you’ve got to do. 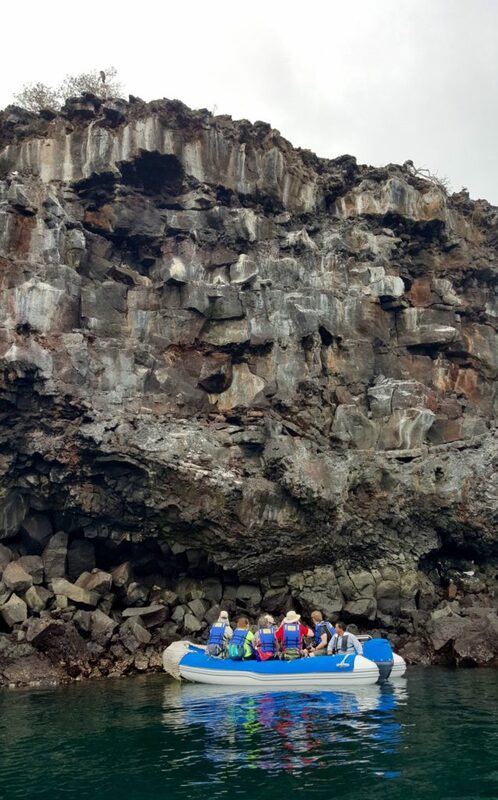 We explored the Galapagos via Ecoventura on their Itinerary B tour, on board their latest luxury vessel, the MV Origin. What Really Happens in the Galapagos? Luxury Cruising in the Galapagos with Ecoventura’s MV Origin Exploring Rottnest Island: The Wild (life) Side of Western Australia What to Pack for the Galapagos How I Manage a Life of Adventure Without Any Major Dramas I’m Off to Fiji to Find Myself! Oh wow love this especially because the Galapagos Islands were one of my favourite trips! I’ve never been there but this makes me want to go and see the very unique bird and animal life there! 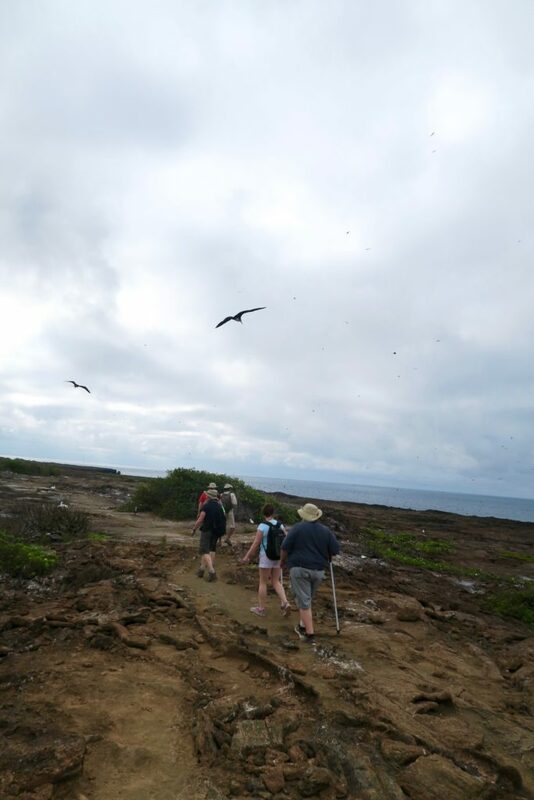 Hi Lorraine, its amazing, even non-animal lovers were transfixed in Galapagos. It’s magic! This brings back such amazing memories. 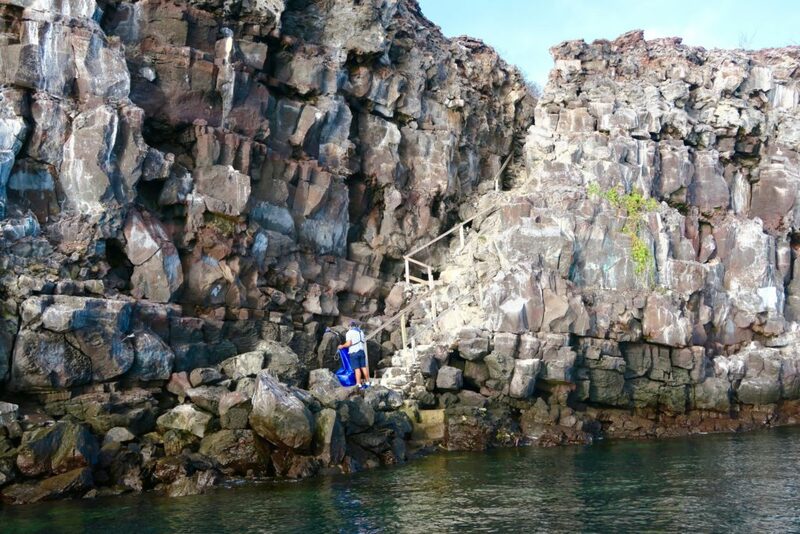 I don’t think anywhere in the world will ever live up to my Galapagos experience! Thanks for the trip down memory lane! Agree with you right there Arianwen, I too kept telling myself that I’m ruined for life after Galapagos – it’s really hard to top that destination. Prior to arriving in Galapagos, Bora-Bora was my favourite place. 2 days into Galapagos, the number 1 spot was immediately replaced. It’s just unbelievably spectacular!